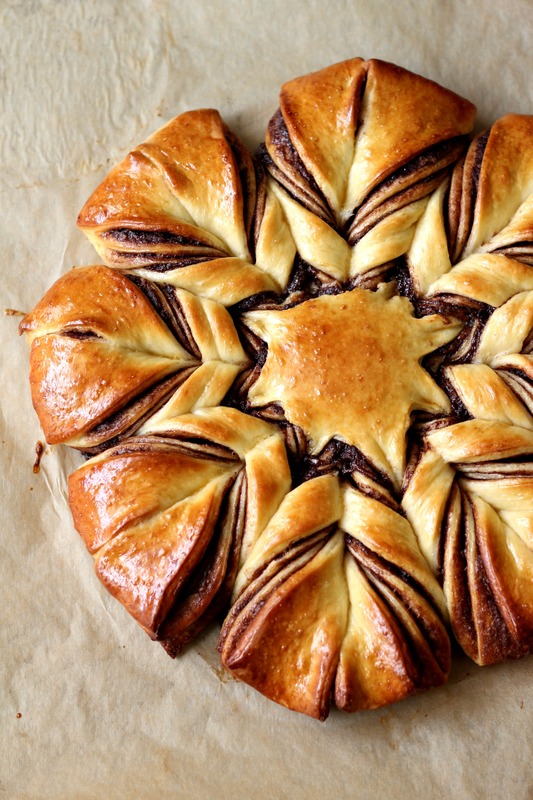 Nutella flower bread for the Nutella lover’s soul, anyone? Well, we used to be huge fans of Nutella and would religiously buy bottles of it until I started making the chocolate hazelnut spread at home. The taste was the same especially since I could control the amount of sugar used. There is so much one can do with this lovely chocolate spread apart from using it as a spread on bread or toast. You can bake with it, add it to milkshakes and smoothies and use it as a dip. These are the few things that I can recall as I type this but I am sure there are a ton of different ways to enjoy it. I have a few recipes that call for a chocolate spread, I will link them below. For the longest time I used it as a breakfast spread and packed it as a treat in my kids lunchboxes. A few months ago I decided to make this lovely flower bread. Yes, a few months ago. Somehow, when I don’t jot down the recipe immediately I tend to push it on the back burner and never get around to posting it. Thankfully I recovered some pics from my archives and decided to post this recipe today. There was a time when I used to religiously try at least one new bread recipe every month. As much as I still love the process and find it therapeutic, these days I don’t have the time required to make fresh bread. My life has become a lot busier ever since school started and their new schedule is super crammed up with activities. Weekends come and go in the blink of an eye and I always wish we had a 3 day weekend cuz I could really use some extra time to experiment with breads. Nevertheless, kids in Dubai invariably get a lot of holidays because of term breaks and such so hopefully my next major baking session will happen during their break. This flower bread is such a delight to make and so wonderful to eat when still fresh and warm out of the oven. My kids thoroughly loved the experience of helping me make the layers and then twist the segments. My son who is turning into an expert at braiding breads was the one who actually assisted me in ensuring that the loose ends were carefully secured and tucked in. He also wanted to be my hand model (in the pic below) – haha! 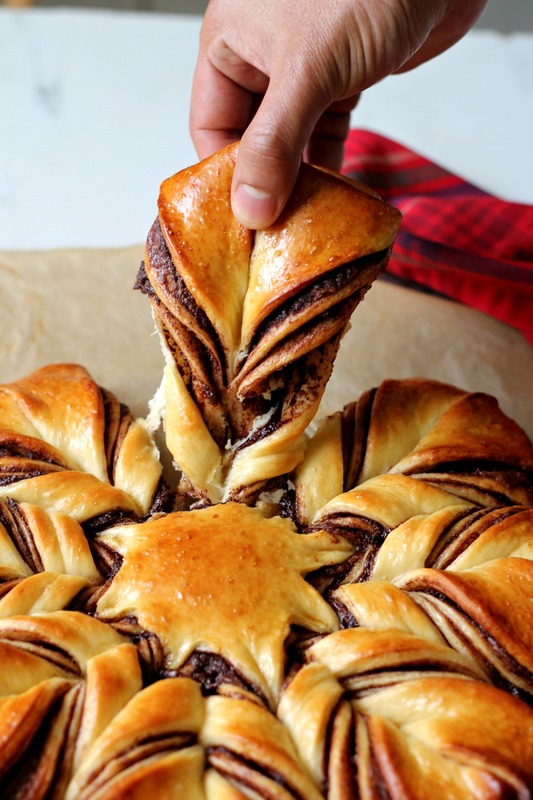 If you are a a Nutella lover, these are some recipes you should totally try! And hey, if you are on Instagram, please follow me there and if you try any of my recipes do use the hashtag #ruchikrandhap and tag me using my Insta handle @ruchikrandhap. Click on the picture below to save it on Pinterest! 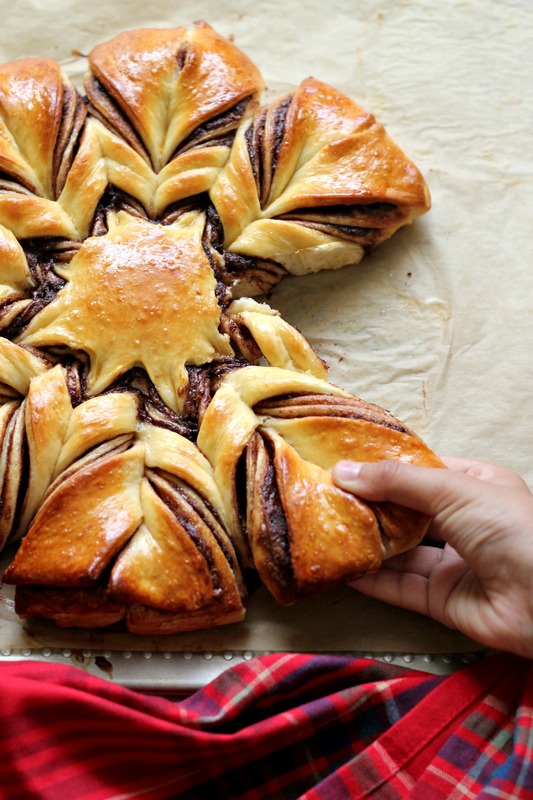 A beautiful bread that not just looks delightful but tastes wonderful as well! A perfect tea time accompaniment and a fun project to make with the kids! In a small bowl mix 1 teaspoon of the sugar, yeast and 1/4 cup of the milk together, cover and keep aside for 10 minutes till the yeast is activated and turns frothy. If the yeast does not froth up, discard it and start again with a new package of yeast. Sift the flour and salt into a large bowl. Make a well in the centre and add the beaten egg, melted butter and rest of the milk and caster sugar. Mix everything well to form a soft, pliable dough. Turn out the dough on a clean working surface lightly dusted with flour and knead the dough for about 10 minutes. Form into a ball and place it in a lightly greased bowl. Cover with cling wrap or a damp cloth and keep in a warm place till the dough has doubled in volume. Line a large baking sheet with baking parchment. When the dough has doubled, punch out the air and divide it into 4 parts. Roll each part into a ball and roll out each ball into a circle of approximately 10 inches. 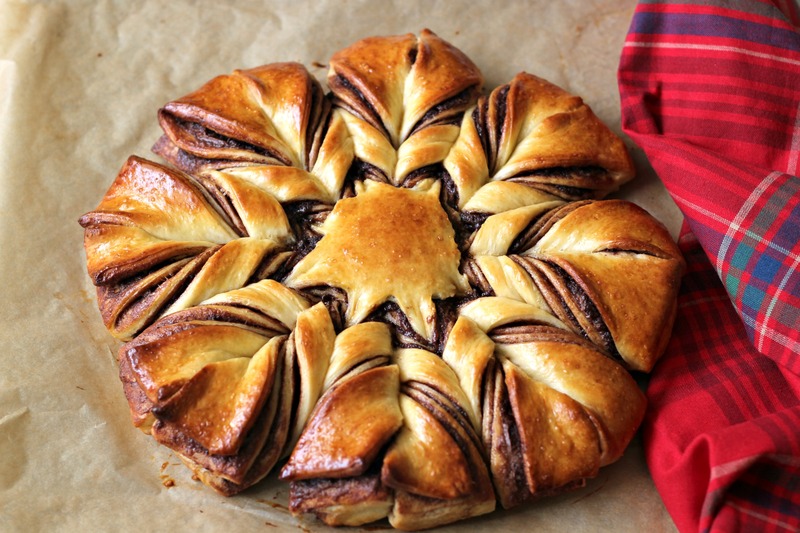 Place this on the baking sheet and spread a layer of Nutella evenly on the surface of the dough leaving about 1/4" gap along the edges. Cover this with the second ball of dough that has been rolled out. 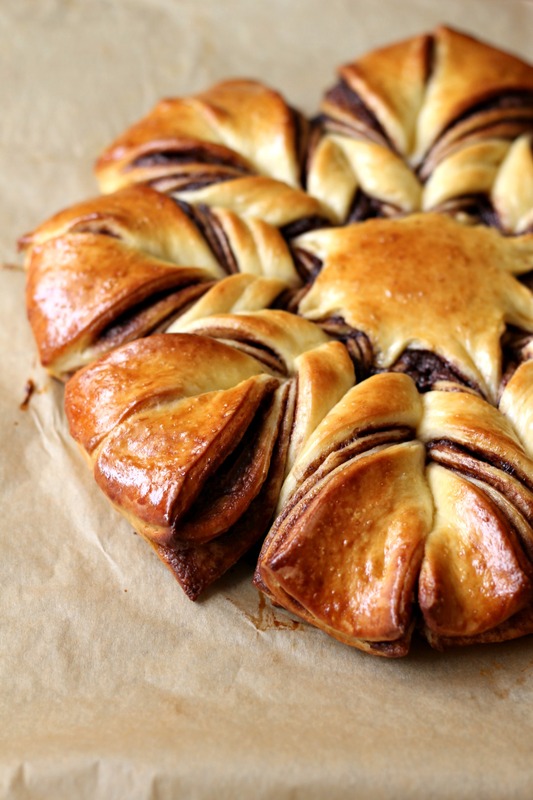 Spread another layer of Nutella and cover it again with the third dough circle. Repeat till all the four dough circles are used up. Do not spread the Nutella on the top most layer. Now place a drinking glass or cup with a 3 cm diameter right in the centre of the stack of dough circles. This is to prevent you from cutting through the dough. Now using a sharp knife cut the stack into 16 segments (like pizza). Now take two segmets next to each other and twist them in opposite directions, away from each other, twice and seal the edges firmly together (you can dab the edges with a little water). Repeat till all segments are twisted. Cover the dough with cling film or a large plastic bag and keep in a warm place to prove again. When the dough has doubled again, brush the surface with the egg wash/glaze and bake it in a preheated oven at 175 degrees C for 16-17 minutes or till the surface looks nice and golden. Remove and let the bread cool on a wire rack before serving. 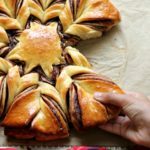 Pull out each segment and enjoy it with a cup of tea or sprinkle with some caster sugar or slather with some more Nutella! This bread looks so delicious! Perfect braids!